Mainway creates warehouse and distribution solutions for any application, integrating ‘best of breed’ equipment and technologies from across North America and globally. 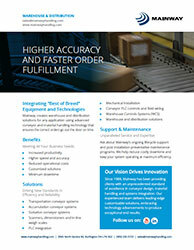 Our solutions enable higher accuracy and faster order fulfillment for today’s distribution operations. With SKU numbers expanding and inventory levels decreasing, our advanced conveyor and material handling technology ensure the correct orders go out the door on time.